Thank god I have fonder memories of NEU. I have been working in the capacity of Director of Multimedia for several months now and I have quietly keep my eyes open for a better position. 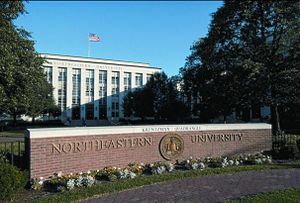 I found a Video Producer position open at my Alma Matter Northeastern University. I enlisted the assistance of my favorite Professor at the University and he got me the hiring Managers name. I sent her an email first via Linkedin, Then a week later to her email at NEU. Then another one. I finally tracked her down to her personal business site and she finally responded saying that I should have sent the email to her NEU email. ??? I reported back to my professor friend and he said he has heard stories like this before regarding the hiring department at NEU. That’s not a good thing for now I am soured on the process of submitting my application to a woman I now have a contentious relationship with. I would love an opportunity to apply for the position but the hiring person has made it impossible now for me to apply by ignoring all my inquiries. It’s very frustrating how social media, email can let you down like this. It’s even more frustrating when it’s your Alma Matter that is the culprit in this case. Thankfully I still retain memories from my Northeastern experience. I am still very close with friends with many I attended school there. I would have loved to work there, but maybe it just wasn’t meant to be.